WEDDING OF VANESSA AND CHRIS. This peaceful and calm area was designed by Bonnie and was built by Jesse, the owners of this lovely lodge. It is a work in progress and don't be surprised if you are not handed some flowers and spades so you can add your own personal touch to the garden. The rocks used for this garden have been gathered by Jesse from the quarterhorse pastures. This partly shaded garden offers seating for those wanting to meditate, talk, laugh and enjoy nature at it's best. Ferns and other shade loving plants and flowers have been planted around the rocks inside. 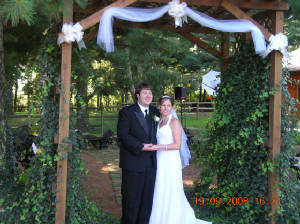 The Rock Garden makes a perfect/ beautiful spot for a wedding any time of the year. 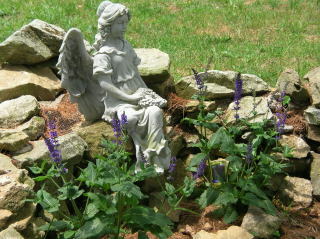 ANGEL IN THE ROCK GARDEN. SHE SITS IN THE CORNER OF THE GARDEN WATCHING OVER ALL THE WEDDINGS, CHILDREN PLAYING, AND ANIMALS SITTING ON THE ROCKS IN THE GARDEN. 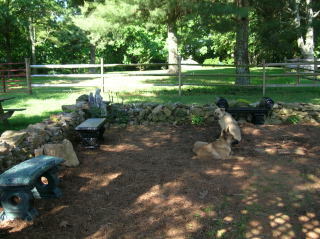 EVEN OUR PETS ENJ0Y THE COOLNESS AND CALMNESS OF THE ROCK GARDEN.